Basic premise of better traction and reducing fuel is linked to increasing volume of pulling lugs on the ground and increasing tire(s) footprint. Footprint = Surface area of tire in contact with the ground. Radial is superior to Bias as enables larger footprint, providing improved traction, fuel economy, and better yield by reducing soil compaction. Compared to Standard Radial, IF & VF lower air pressure increases footprint, providing improved traction, fuel economy, and better yield by reducing soil compaction. IF = Improved Flexion. Same weight carrying capacity using approximately 20% less air pressure than standard radial. VF = Very High Flexion. Same weight carrying capacity using approximately 40% less air pressure than standard radial. How do IF VF tires carry same load with less air pressure? IF VF high technology sidewalls carry more load than standard tires. 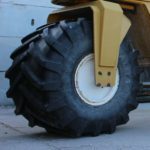 Flotation tires have wider section widths than standard tires to improve traction, fuel economy, and improve yield by reducing soil compaction. 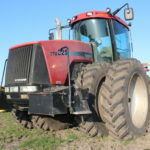 In wet conditions, flotation tires may enable equipment to work without getting stuck. Duals are defined as 2 tires on each side of axle, or 4 tires per axles. Duals, compared to single tire of same size, improve traction and yield by reducing soil compaction. Triples are defined as three tires on each side of axle, or 6 tires per axle. Triples, compared to duals of same size, improve traction and yield by reducing soil compaction. All information is provided in this blog solely to provoke thought. All deductions made from information on this site must be confirmed by Certified Ag Tire Dealer before use. Ag Tire Talk does not recommend anyone conduct tire service work with exception of Certified Ag Tire Dealer Professionals. Can BIAS Tires Beat Radials?